Pulled this out of the wine fridge. Happy, because it’s a Cab! Sad, because I have no recollection as to how I acquired it. 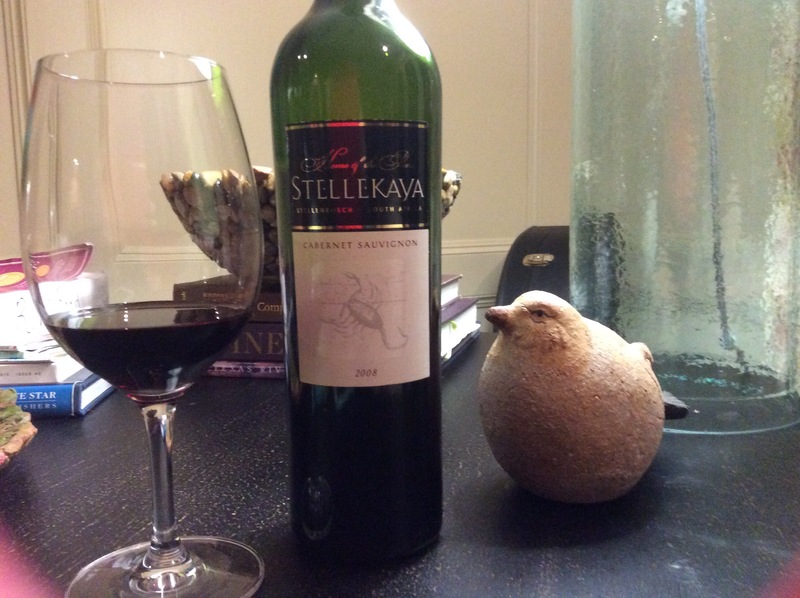 Stellakaya Wine of the Stars Cabernet Sauvignon from Stellenbosch in South Africa. 2008. The wine is named for the bright star Antares in the constellation, Scorpious, and you would only know this if you recognized the scorpian on the label. This was a fun surprise. I had no preconceived notions since I have no idea what I paid for this. The wine is complex with flavor of rare roast beef, coffee, leather, dark plum, fig and eucalyptus. Rare roast beef is good. It’s a savory quality that I enjoy! My mom always added instant coffee to her gravy for depth of flavor and color. So all of this is welcomed by me!! So I’m giving you the wide price range of $25-75. How’s that?? Google was not my friend when it came to researching this wine! What to have with Shrimp Dinner?